Combine Lego and Frozen and you have a recipe for one of the most sought after toys this Christmas. 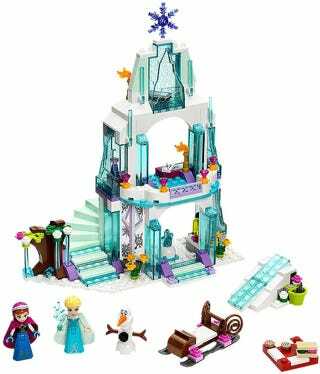 The problem is that Elsa's Sparkling Ice Castle (41062) isn't slated for release by Lego until January 1st of 2015. Fortunately, if you know how to look and where to look, you might just find this set buried in the depths of retail stores that have received them early. The set has been spotted at Target for sure, in stores only. Mashable suggests utilizing the utility BrickSeek to check if local Target stores have the set in stock. If you enter your Zip Code and then the DCPI number for the set (086-14-2474) on this page and you can see if any stores in your area have the item in stock. There are about a half dozen of them at my local Target right now. The set has also been spotted at various Toys R Us stores across the United States. This is actually where I picked one up just two days ago, which I'm giving away as a present. It was simply sitting out on the shelf with about a dozen others. As a last resort, there may still be time to order it from eBay or Amazon though, the prices are quite inflated. With super fast shipping and the markup that people are asking for these, you're going to be up over $100 for a set that retails for $39.99.